3. The above, with larger groups are also available. Please inquire for details. We also offer tours that start and finish in Takayama. These are 4-hour tours, and are for a group of 1~6 people. Group prices are 25,000 yen. We are looking forward to showing you the beauty of this area of Japan. Please do not hesitate to contact us via our contact form. Those exploring outside of Kanazawa will find more UNESCO World Heritage Sites. Shirakawa-go is part of the Hida region, and is famous for the gassho-zukuri village found there. The houses were built using a traditional style of the minka (non-samurai houses), and have a thatched, peaked roof that looks like two hands in prayer (gassho). The upper floors of some of the houses were used for silk farming (sericulture), as they had a large space available to store silkworms and mulberry leaves. Shirakawa is a must-see area if one would like to grasp the rich contrast of life in this region. 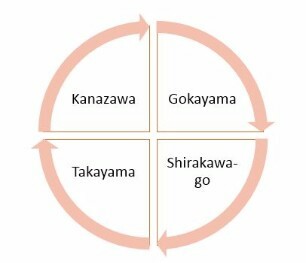 Why not let us take care of your group with a private car to Shirakawa-go? Gokayama is in the city of Nanto, also a drive from Kanazawa. It was an extremely secluded village, so modern times bypassed the area. While cities and towns in other parts of Japan built new, modern buildings, many of the wooden and thatch houses in the gassho hamlet of Gokayama are over 300 years old, and some are 400 years old. The Japanese prince, Fumihito (Prince Akishino) has said "One of the three places I like most in the world is Gokayama". Takayama became what it is today in the 1500s, and developed its own unique culture due to its seclusion and high altitude. It is famous for its traditional carpentry expertise, and its carpenters have worked on the Kyoto Imperial Palace, and other nationally important shrines, temples and palaces. It is known locally as Hida-Takayama, and visitors there can enjoy great food, tradition views, and a feeling of "traditional town-life in Japan". Don't forget to try the Hida Beef while you are there! 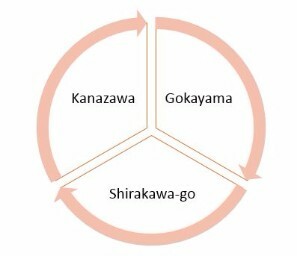 Kanazawa tours ...and beyond ... can take you to one, two or all three of the above areas. Leave your traditional Japan experience to us, and your trip will be full of pleasurable memories.